D'Appolonia has conducted numerous research projects, most commonly for agencies of the federal government. This work has included projects where geophysical techniques were evaluated relative to new applications, evaluation of subsidence associated with longwall coal mining, evaluation of the benefits of co-disposal of flyash and coal refuse and development of new techniques for construction of coal refuse impoundments. Our staff has the advanced technical knowledge and practical experience to conduct these types of projects. They have published many technical papers describing the results of these efforts. 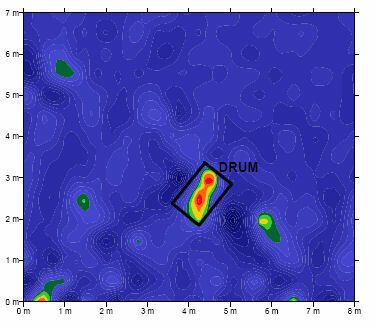 GPR image showing the detection of a buried drum taken from report prepared by D'Appolonia. D’Appolonia working in association with Michigan Technological University conducted research with the objective of improving the interpretability of the ground penetrating radar (GPR) geophysical technique. D’Appolonia developed a testing program, prepared design modifications for a coal refuse facility and provided permitting services related to demonstrating the benefits of combining coal refuse with flyash in disposal landfills. Mixtures ranging from 0 to 60 percent flyash were tested. D’Appolonia was retained by the U.S. Department of Energy (DOE) and the U.S. Bureau of Mines to study ground subsidence caused by longwall mining. The three-year study involved monitoring ground subsidence and assessing correlations with mining activities for a longwall mine in the Central Appalachian region.